When Niels and I were looking at model homes, we often stopped to admire what we thought was a pretty stone walkway or patio. 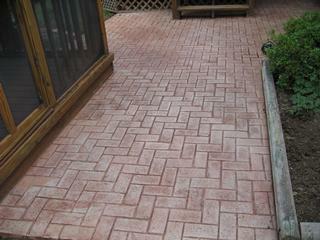 It wasn't til much later that we discovered the beauty of stamped concrete. 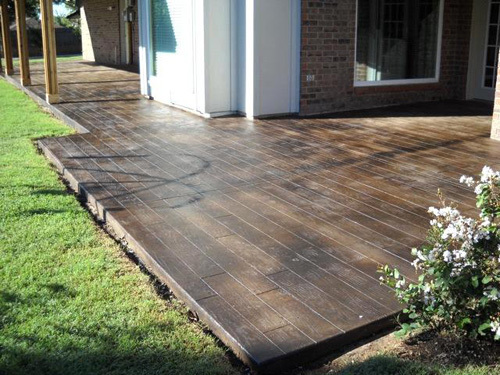 Stamped concrete is a way of using forms to mimic any look you'd like: stone, wood, tile, brick...you name it. It has all the look of pricier materials with not of the white-glove maintenance...or price. 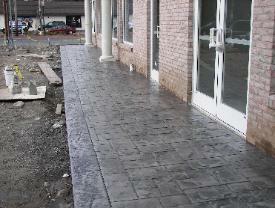 Here's a few samples of stamped concrete. Can you believe this is concrete, and not wood? Just for giggles, I took a field trip to the local concrete yard to check out what we could do. Fortunately, I really liked this one, which is the least expensive option because the base color is plain concrete and only the top has charcoal added. I learned that this makes a big difference because when you add color to the main (integral) color, the crew has to clean out the truck a bit more thoroughly...which of course, you pay for. Ashlar Slate design with plain concrete and deep charcoal release. So today was the big day. My toddler son and I were able to watch part of the work this morning, but unfortunately, naptime got in the way of seeing the actual stamping process. The crew prepped by placing rebar and replacing the original supports with new ones that were off the porch. This little Bobcat made about 30 trips back and forth with the concrete. All done. We left for naptime while the concrete set a bit. Before we left, the foreman showed me the forms they used and how they fit together. There are several slightly different forms so that the overall effect is orderly, but with variance. Our fabulous new back porch!